Next general election: Should the United Workers Party boycott it or not? To boycott or not to boycott the next general election must be the major question on the minds of the leadership of the opposition United Workers Party (UWP) as it strives to raise awareness of the issue of free and fair elections and also to influence the Electoral Commission to institute meaningful electoral reform in a hurricane battered environment. That is not an easy question for the UWP to answer. Undoubtedly, the Dominican public has noted the statement that the UWP leaders have been uttering for some time now. For instance at last month's consultation at the Goodwill Parish Hall, Lennox Linton, the political leader of the UWP repeated declarations that he and other leaders of the party have expressed many times in the past: that there will not be another general election in Dominica without electoral reform. Is this a genuine threat of a boycott of the general elections or is this another example of pure balderdash? What we are sure about is that there is hardly enough time to consolidate this comprehensive reform of our electoral laws and practices that the UWP envisages before the next general election. 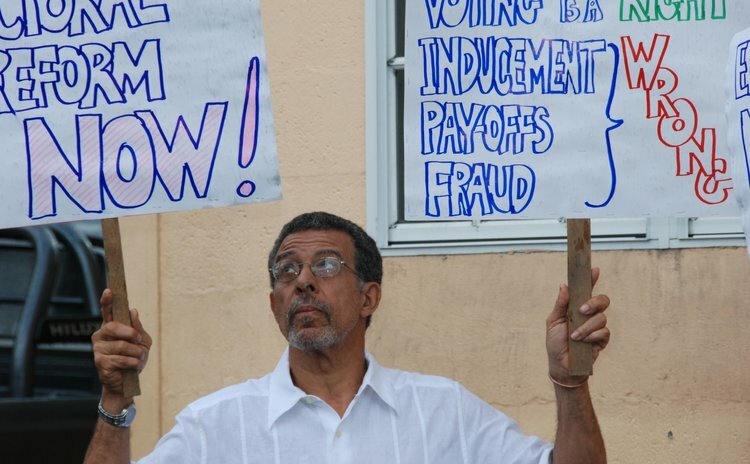 Furthermore, the ruling Dominica Labour Party (DLP) has shown very little interest in certain crucial aspects of electoral reform such as campaign financing legislation, putting a limit on campaign spending and providing fair access to the opposition to DBS radio, for instance. The DLP is not even bothering to discuss these issues. So Linton the UWP will have to decide whether the party wants comprehensive electoral reform, before the next general election or will the UWP accept some minor changes to our electoral laws that may be feasible within the period left before Dominicans are asked to head to the polls. Remember Mr. Skerrit has the constitutional authority to call an election any time that it suits him. By the way, fixed dates for elections are also one of the changes to our electoral laws that the UWP has proposed and that the DLP has generally ignored. But if by its statement the UWP is saying that the party won't contest the next general election if there is no electoral reform then that is a problem with which Dominicans will have to contend. The UWP itself may have to contend with the view that boycotts usually favour the ruling party. In 2010 Matthew Frankel, a fellow at Foreign Policy at Brookings published a paper entitled "Threaten but Participate: Why Elections Boycotts are a Bad Idea" in which the author argues that election boycotts rarely work and that the boycotting party always ends up worse than before. Frankel writes: "In short, you can't win if you don't participate. A comprehensive study of 171 threatened and actual election boycotts at the national level between 1990 and 2009 demonstrates conclusively that, other than a few rare exceptions, electoral boycotts generally have disastrous consequences for the boycotting party, rarely result in desired international attention or sanction, and many times further entrench the ruling leader or party". He added that there are a number of negative outcomes from election boycotts: "First is the marginalization of the boycotting group. This is a common result because the boycott itself means that the opposition party is willfully removing itself from periodic competition for political power. In many developing countries, control of the government and its ministries means control of vital outlets for patronage. Choosing not to participate thus relegates the group to the position of vocal opposition without influence in the competition for scarce state resources. Without means of patronage to provide, the opposition is forced to rely on popular discontent with the ruling regime as its mobilizing cry". Frankel suggests that dictatorships or despots are usually "immune to boycotts" and rarely do the anticipated international outrage occur at the unfairness of the election. "The boycott might remove the veneer of democratic legitimacy of the ruling regime, but as we have seen, it doesn't change the facts on the ground," Frankel wrote. However, the author suggests that there are circumstances where boycotting an election can work to the advantage of the boycotting party. "Of the 171 cases examined for this study, a small minority (roughly four percent) resulted in positive outcomes for the boycotting parties. These cases fell into two very different categories: cases where the opposition party had considerable popular support and the boycott was merely one piece of a larger opposition campaign that could mobilize street protests, strikes and other forms of civil unrest, and cases where electoral laws required quorums to proceed". We have had our share of boycotts of elections in the region with mixed results for the boycotting party. There were election boycotts in Trinidad and Tobago in 1971 and in Jamaica in 1983. In Trinidad, the People's National Movement (PNM) won all 36 seats after the major opposition parties boycotted the 1971 elections over voting machines. In Jamaica, the main opposition People's National Party (PNP) boycotted the 1983 elections because the party in power, the Jamaica Labour Party (JLP), refused to update the electoral list. Although several minor parties participated in the elections only six of the 60 seats were contested; the JLP easily won all seats. Members of the UWP who may argue that their party should boycott the upcoming elections will be encouraged by the fact that the JLP in Jamaica won the 1989 election that immediately followed the election that it boycotted. But then the PNM in Trinidad won again in the 1976 election that immediately followed the boycotted election. The point we wish to stress here is that the UWP must be aware that with almost everyone dragging their feet on implementing electoral reform, a comprehensive electoral reform programme is not feasible before the next general election. Therefore, the UWP must explain to Dominicans what the party means by "there will not be another general election without electoral reform".